Originally published at MinnPost.com on 11 April 2014. Used with permission. Some days it seems like jazz in the Twin Cities is in sad and sorry shape. The Dakota in Minneapolis programs a lot less jazz than it used to. The Artists’ Quarter in St. Paul closed at the end of December; when a new venue opens in that space later this year (in August?) under the Dakota’s management, it will no longer be exclusively a jazz club featuring mostly area musicians. (Dakota owner Lowell Pickett told MPR’s David Cazares last week that jazz “will certainly be a part of” the mix at the new club, and local musicians will “certainly … be part of that”). Northrop reopened with no mention of the great jazz series it once presented. (The last we heard about that was in 2011, when then-director Ben Johnson sent a letter saying the series had been “postponed.”) Orchestra Hall reopened with occasional jazz performances but no jazz series. But jazz in the Twin Cities has rarely been healthier, more alive and exciting than it is right now. It’s just happening in different places, in different ways, and increasingly at the initiative and under the control of the artists themselves. There’s less reliance on bookers and venues, more taking charge of everything from scheduling gigs to renting rooms, raising money, making records, getting grants, arranging tours and handling publicity and promotion. Earlier this week, trumpeter Steve Kenny announced a new series that could serve as a poster child for jazz today. 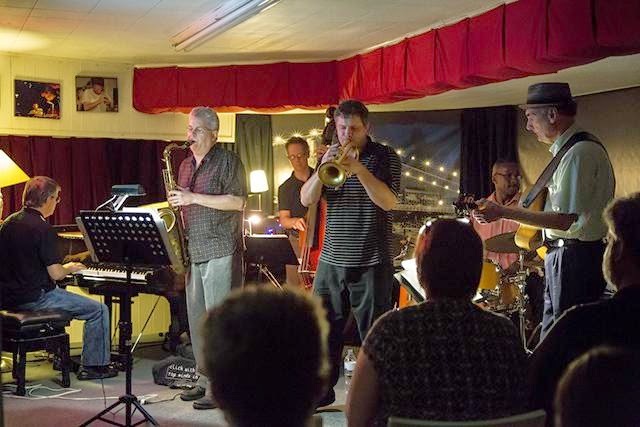 Starting July 10 at Studio Z, continuing Thursdays through Sept. 11, funded in part by a grant from the Metropolitan Regional Arts Council, the “All Original Jazz Series” will feature ten weeks of concerts by local jazz ensembles playing their own original compositions. Kenny’s series follows guitarist Zacc Harris’s MRAC-funded monthly concert and workshop series “Jazz at Studio Z,” which continues Saturday, April 19, with the Cory Healey 4tet. Soon after the AQ closed, Jazz Central, a nonprofit performance-rehearsal-recording space owned and operated by drummer Mac Santiago and pianist Tanner Taylor, stepped up its game; it now features live jazz five nights a week, from small ensembles to big bands and vocalists. Last Sunday, bassist Chris Bates held a private concert at Creation Audio to celebrate his new recording, “Good Vibes Trio”; his official CD release is Monday night at Icehouse. Tonight (Friday, April 11) at Bethel’s Benson Great Hall, Jeremy Walker holds the CD release for “7 Psalms,” his self-made album of ambitious and beautiful original music, complete with jazz quartet, soloist and choir. Earlier this year, several Twin Cities jazz ensembles formed Shifting Paradigm Records to sell their music and boost their visibility locally and nationally. “The closing of the AQ is not a requiem for our jazz scene,” Kenny told MinnPost on Wednesday. “The audience has to be a bit more savvy about the locations, more willing to look up where events are on given nights. But the gigs are still happening. The year after year increase in the quality of local jazz is palpable. Each year, the scene has better and better musicians … What’s happening now is as good or better than previous years. In a couple of months, every night of the week will have a compelling jazz performance at a good venue with compensated musicians and decent audience development.” Call Kenny an optimist, or call him a realist. Just don’t call jazz in the Twin Cities dead.